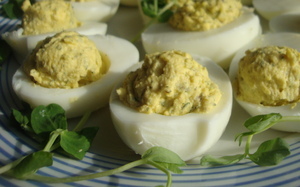 Posted on Thu, Apr 12, 2012 : 8 a.m.
At one of the Seders I attended at Passover, the topic of deviled eggs came up. Everyone has a favorite recipe; some add chopped ham or salami, some add hot sauce, some add horseradish, some add dill. There is no wrong way to make these simple but delicious treats! And since I always like to tinker with things, I make the base with mayonnaise, Dijon mustard, and dill, but often add other items according to my whims. These are one of Jeremy's favorite foods, so I usually make them for holidays. They were ideal for both Passover and Easter, but can be served at picnics and barbecues and "just 'cause." Carefully pop the yolks out of the eggs and place them into a small mixing bowl. Place the whites onto a serving plate. To the egg yolks, add the mayonnaise, mustard, dill, salt, pepper and horseradish; mix well. Use a small cookie scoop (if you have one) and place the filling into the cavities of the egg whites. Decorate the plate with pea shoots or fresh dill or edible flowers or some other colorful splash.